Dolerite. (Gk. dolos-eros = trick + lithos = stone). 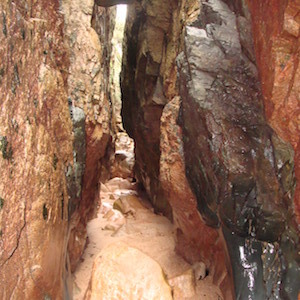 Bifurcated dolerite dyke below Le Saut Jeffroi. In Jersey, this rock type crops out in the South East Igneous Complex as the Jersey Main Dyke Swarm which is beautifully exposed along the whole of the south coast. Comprehensive, detailed descriptions and analyses are given by Lees (1990, pp. 273 - 290). Dolerite dykes, Le Croc, La Motte (Gr. Is.). In the south east, the dolerites contain both fresh and altered augite and labradorite and also occasional hornblende. The crystal textures vary from aphyric (finely crystalline) similar to that of basalts, to porphyritic and ocellar (eye-shaped). Chlorite is also widespread as an alteration product of the hornblendes due to low grade regional metamorphism rather than weathering which can produce highly altered textures and a resemblance to epidiorites (Bishop & Bisson, 1989, p.62). 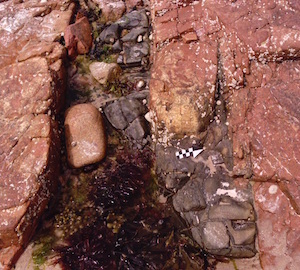 The dolerite is not of uniform composition or crystal size and variations due to composite intrusion and chilling at the margins can be seen clearly in the dykes south of Le Hocq slipway (Nichols & Hill, 2004, p. 47 - 49). Composite dykes also occur, and generally have dark grey, doleritic margins and medium to light grey-pink quartz porphyry centres, but the more detailed composite arrangements of the dolerite (X) and porphyries (Y) are described in detail by Lees (loc. cit. p.277) and vary from XYX to XYXYX. Their contacts are sharply defined and rounded (lobate) or irregular (flame-like) and there are xenoliths and xenocrysts of each rock type within the other. Finer crystalline, possibly chilled, margins occur in some and they also intersect each other in places. They are normally vertical and strike c. NE-SW here in the eastern part of the Jersey Main Dyke Swarm. At the south eastern corner near Seymour Tower, dolerite occurs in elongated lenses (pods) and has a uniform texture due to regional metamorphism (described as granoblastic). Small quartz xenocrysts also occur in these dykes possibly stemming from the intrusion of the adjacent granite. Dolerite dykes can also be seen in the beach outcrops of the South West Igneous Complex in Ouaisné and Portelet Bays. 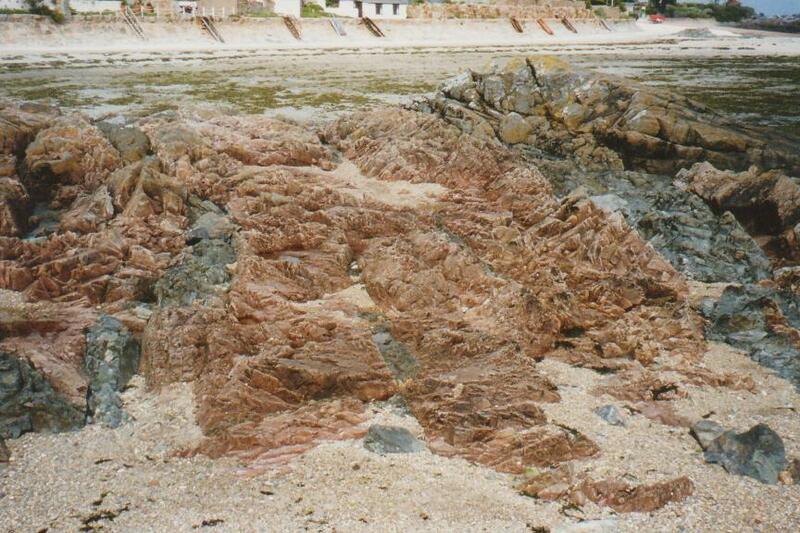 In Ouaisné, a dolerite dyke in the low beach outcrop strikes c. E-W and its northern junction with the aplite granite strikingly demonstrates the way the intruding magma was controlled by the joint pattern. 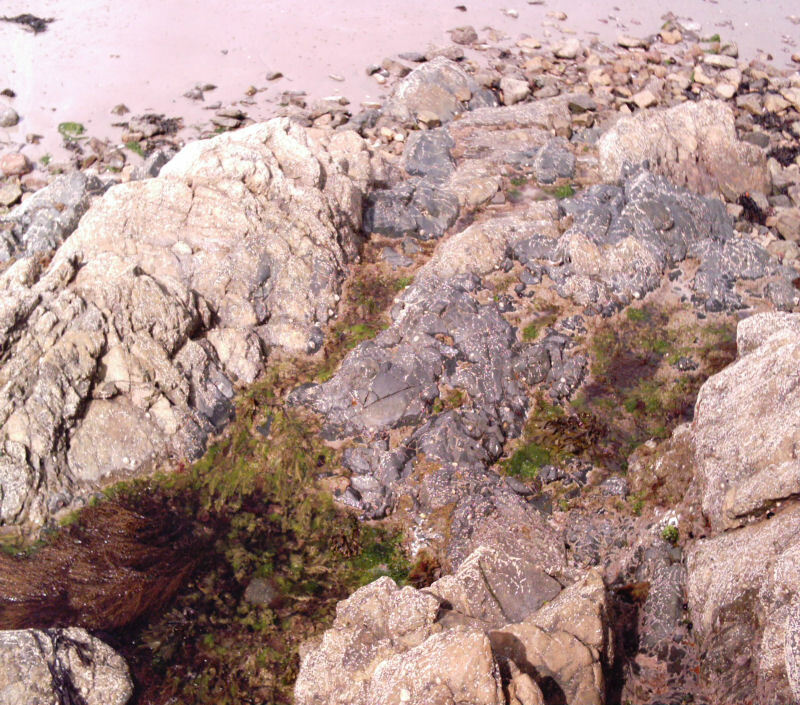 Dolerite dykes also crop out along the eastern side of Noirmont Point, Bouilly Port, Beauport and to the east and north of La Corbière Point at La Rosière and Le Grouet wave-cut platform respectively. Dolerite also forms sills (or low-angled dykes) but in the North West Igneous Complex. They are well exposed in the granite from Le Pulec to Grosnez Point with the best being exposed from Le Pinacle, an ancient stack, northwards along the base of the adjacent landward cliffs. In contrast to the near vertical dykes of the south east, these dip to the south east at c. 10°. Only two examples occur on the south coast; one is a highly altered basic sill which crops out at the western end of Portelet Bay and further west by La Pointe du Fret and the other, a striking composite sill at La Collette on the south side of St. Helier. Lees, G. J. 1990. The geochemical character of late Cadomian extensional magmatism in Jersey, Channel Islands, in D'Lemos, R. S., Strachan, R. A. and Topley, C. G. 1990. The Cadomian Orogeny. Geological Society Special Publication, No. 51. The Geological Society. London. Nichols, R. A. H. & Hill, A. E. 2004. Jersey Geology Trail. Private publication printed by the Charlesworth Group.